Scientists report on their identification of a previously undetected, but widespread, structural feature in the human body that could play a key role in how tissues and organs function, and also impact on disease mechanisms and spread. 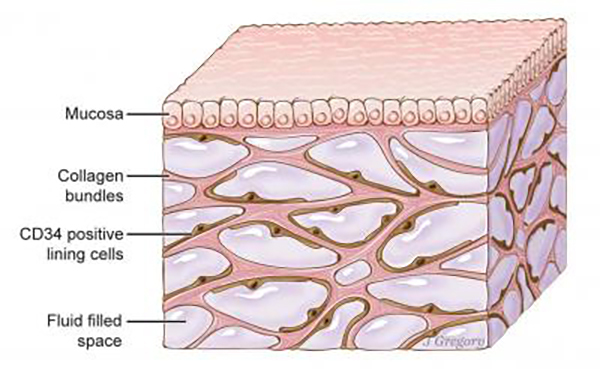 This layer of interconnected, fluid-filled compartments, dubbed the interstitium, is supported by collagen bundles and elastin, is compressible and distensible, and appears to act as a shock-absorbing buffer around organs and tissues as they stretch, flex, and compress. Previously undetected because of the way that microscope slides are prepared, this newly identified interstitial architecture has now been found to underlie the skin, line the digestive tract and lungs, surround arteries and veins, and act as a bumper for muscles. The cells that reside in the space, and collagen bundles that they line, change with age, and may contribute to the wrinkling of skin, the stiffening of limbs, and the progression of fibrotic, sclerotic, and inflammatory diseases. Importantly, the interconnected spaces drain to the lymph nodes and act as a carriageway for interstitial fluid, which could help to explain how cancers metastasize. The researchers also suggest that sampling interstitial fluid from these compartments directly may even offer a new approach to diagnosing disease. “This finding has potential to drive dramatic advances in medicine, including the possibility that the direct sampling of interstitial fluid may become a powerful diagnostic tool,” claims co-lead researcher Neil D. Theise, M.D., at the Mount Sinai Beth Israel Medical Center, who is also a professor in the department of pathology at New York University Langone Health. The investigators claim that their findings could mandate both a rewrite of anatomy textbooks and a rethink on tissue and organ function and disease mechanisms. “Our findings necessitate reconsideration of many of the normal functional activities of different organs and of disordered fluid dynamics in the setting of disease, including fibrosis and metastasis,” they write in a published paper in Scientific Reports (“Structure and Distribution of an Unrecognized Interstitium in Human Tissues“). Studying tissues using traditional microscopy would identify the submucosal layer and tissue lining organs and surrounding blood vessels as “densely packed barrier-like walls of collagen.” The interconnected compartments discovered by the Mount Sinai Beth Israel team haven’t been seen before because the fixing techniques used to prepare microscope slides drain away fluid. This causes the connective protein meshwork surrounding the now fluidless cavities to collapse and squash flat, so that it appears as though the submucosa and tissue layer surrounding organs is comprised of dense connective tissue. Any thin spaces remaining in biopsy slides appear like tears in tissue, rather than the remains of previously fluid-filled compartments. “This fixation artifact of collapse has made a fluid-filled tissue type throughout the body appear solid in biopsy slides for decades, and our results correct for this to expand the anatomy of most tissues,” says Dr. Theise. The new findings stem from clinical investigations back in 2015 by Beth Israel Medical Center co-authors David Carr-Locke, M.D., and Petros Benias, M.D., who were using an imaging technique known as probe-based confocal laser endomicroscopy (pCLE) to look for metastasis in a patient’s bile duct. (pCLE combines endoscopy with laser and sensor technology to provide a microscopic view of living tissues.) They identified the fluid-filled compartment while imaging the patient, but when they made and viewed microscope slides from biopsies of the same tissue, the same compartments disappeared. For their latest studies, the team used a freezing technique to prepare surgically obtained tissue specimens from cancer patients in such a way that the interstitial compartments weren’t disrupted. Examination of these samples, and subsequently a range of other tissues, identified the same architecture of fluid-filled compartments and their supporting collagen bundles and lining cells in numerous tissues and organs that move or compress.